Even though a study conducted by TSheets found that nearly 60% of self-employed workers in the U.S. said they either worked every weekend or every other weekend, if you’re truly honest with yourself, you’ll probably admit that there’s a difference between spending time on work-like activities and actually working. However, if you own your own business, wasting time means wasted opportunities—time that could be devoted to strengthening your business plan. If you’re caught in a cycle of wasting time, we’ve got a five-point plan for overcoming procrastination once and for all. How will you know where your time is disappearing if you don’t track it? While keeping a time log may seem time-consuming at first, it doesn’t have to be, and we promise it will be a revelation as you identify and tame your time wasters at work. Time management expert and author Laura Vanderkam has written several books explaining the benefits of time tracking. Her premise is that we all have 168 hours in a week, and yet some people seem to accomplish a whole lot more than others. Seeing where your time actually goes is key to this procrastination-busting plan. Now you can clearly see those pockets of time when you’re at work, but not actually working. We all have our time wasters of choice, and for many of us, it’s social media. But that’s certainly not the only rabbit hole that’s easy to fall down when you know you should be working. If you work from home, you might be sidetracked by a dog that needs walking, laundry that needs washing, dinner that needs to be started or shows that need binge-watching. And let’s not forget email. Some reports find that an average person can send and receive 200+ emails a day, which can gobble up an incredible amount of time. Email can be a particularly dangerous pitfall because it makes you feel like you’re being productive even though you’re not. After all, doing online research is fine, but if you discover that you are wasting time on the internet keeping up on celebrity gossip or checking last night’s scores, you might decide to reclaim those hours for pursuits that will move you closer to your business goals. 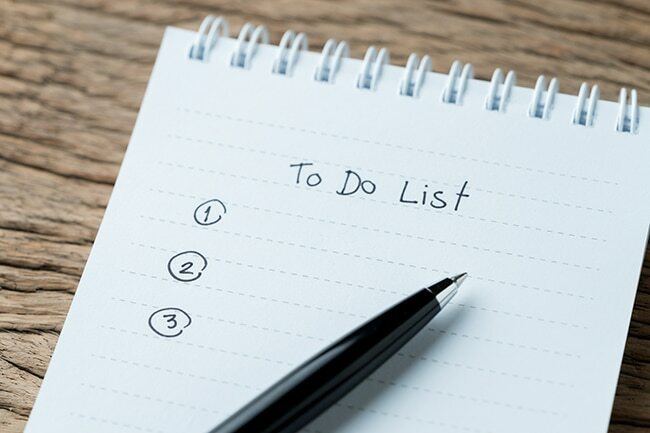 Many people love having a to-do list and get great satisfaction from crossing items off as they’re completed. While that can be an effective way to manage your day, you might well find at 6pm that there was more list than there were hours in the day. Maybe your to-do list includes scheduling a meeting with a new vendor, sending invoices and updating your business plan—plus three scheduled client appointments. When you start writing out those activities in blocks—including drive time to meetings, etc.—you’ll see how your day will unfold, and you won’t be tempted to waste time because you’ll want to stay on schedule. That’s also why you should write a schedule that includes time to eat lunch, have an email break and walk the dog. By writing it down, you give yourself permission to do these activities that are important for much-needed mental or physical breaks. Then you take a five-minute break. After four Pomodoros, (that’s what they call each segment), you have earned a longer 15-minute break. The technique helps keep you on task but also gives you permission to enjoy your short break, which can help prevent longer time-wasting sessions. Of course, you can lengthen your Pomodoros, but make sure you’re committed to doing one task for the entire time. It’s easy to squander those 10 minutes by checking in on social media, but if you, like many, have at least three of those 10-minute blocks per day, that’s 30 minutes that could be devoted to accomplishing a task instead of wasting time. At the end of the week, you might have identified five new clients to contact, without needing to devote an entire hour to the research. Once you start allocating these micro pods of time, it will become second nature. And then, by all means, enjoy your Instagram time. But schedule it in rather than letting it become a time waster. Figuring out how to stop wasting time can be challenging at first, but you might be surprised when you realize how much you can get accomplished in the extra time that appears once you eliminate time wasters. You’ll be amazed at how you can move your business forward by overcoming procrastination simply through using a time log, a schedule and a timer.